"More often, homeowners want to replicate something seen in a magazine. That was not the case here. The couple had the courage to follow their hearts and instincts. While the “before” kitchen was renovated by the prior owners only 10 years ago, the new homeowners – having just moved from Manhattan to the suburbs – envisioned a sleek contemporary kitchen with an interesting wood grain. European Applewood was selected for its beautiful color and undulating grain characteristics. The challenge was selecting appliances and materials that complement the remarkable wood. • The wood grain is matched and placed in a horizontal pattern on flat panel doors. This allows your eye to follow the grain pattern around the room. • Sub-Zero Appliances were selected since they virtually disappear behind door panels. • The finishing topcoat was an acrylic urethane to reveal the full character of wood grain. • The Wenge wood island countertop espresso coloring picks up the distinctive wood grain; Pietra di Cardoso for perimeter countertops blends with stainless elements. • Translucent grey-blue glass tile captures the attractiveness of the warm wood tones. • Grain matched outlet covers and stainless toe kicks complete the kitchen details. Additionally, the husband’s passion is cooking and dreams of opening a restaurant. He cooks the daily family meals and hosts large dinner parties. Sub-Zero, Wolf, et Cove appliances provided flexibility in product options to customize a kitchen for their personal needs. • A Sub-Zero 736TR All Refrigerator was used in place of a large refrigerator\freezer. This change allowed for more refrigeration, space for a Sub-Zero UC-15I Ice Maker, and larger wall cabinets on the "Refrigerator Wall". • A Sub-Zero 700TFI All Freezer was placed near-at-hand next to the pantry. 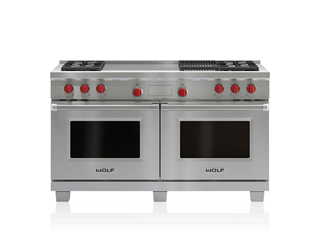 • A Wolf 60” Duel Fuel Range with its professional look, famous red knobs and its "performance under pressure" wins the husband’s heart. • The wall cabinet with white laminated glass doors has special LED lighting inside. The LED lighting is routed into the shelf bottom and can be easily adjusted without any loose wires. LED lights are less hot, last longer and use less energy. 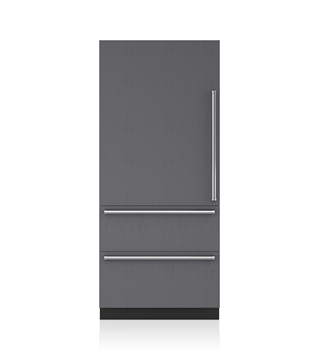 • Magnetic stainless refrigerator end panels serve as a place to display children’s art."